Sustainability: why should business care? - GreenBuzz Berlin e.V. Sustainability is on the radar of most companies as society is increasingly expecting from businesses more than just delivering a product and making profits. They should go beyond their operations and products and include commitments to ensure social and environmental sustainability. According to Larry Fink, CEO of BlackRock, the largest money-management firm in the world with more than USD 6 trillion in assets under management, “to prosper over time, every company must not only deliver financial performance but also show how it makes a positive contribution to society”. Currently, the integration of sustainability in organizations takes place at different levels depending on, e.g., the company’s business model, strategic objectives and purpose. Although leading companies have made fundamental shifts to redesign their operations and products following sustainability principles, most enterprises take a fragmented, reactive approach —launching ad hoc initiatives to enhance their “green” credentials, to comply with regulations, or to deal with emergencies— rather than treating sustainability as an issue with a direct impact on society and business results. In this sense, understanding the implications of those approaches is imperative to build an effective business strategy that will be key to achieve enduring growth with a positive impact on society. Therefore, this article aims to respond to the following question: should companies make sustainability the starting point of what they do or rather take the business needs as a starting point and then highlight how that contributes to sustainability? The world is radically changing, driven by global megatrends. Whether it is climate change, resource scarcity crisis, food insecurity, disruptive technologies, changing demographics or rising geopolitical uncertainty, these megatrends have a massive impact in the business environment and can fundamentally change the way companies will operate over the coming decades. In this scenario, the word “sustainability” becomes a synonym for the capacity of organizations to adapt to the potential impacts of global megatrends and endure over time. And, making marginal improvements on the way businesses are conducted, through a collection of isolated sustainability measures, will not do the trick. In other words, some tweaks here and there, a spot product innovation, or rebranding current products and operations to highlight sustainability features is the same as trying to survive in a changing world without adapting to it. A sustainable business model will be a necessity for the simple reason that this business-as-usual approach won’t allow the world to meet its huge environmental and social challenges while promoting economic growth. Then, the future of sustainable business lies in the creation of resilient business strategies that take sustainability as their foundation, responding to this rapidly shifting external context as interconnected business matters. In this sense, organizations around the world are realizing that they should look beyond their own challenges — direct or indirect — as a mean of transforming the very way that they design strategy, be it through new products, a new purpose or a new business model. Nevertheless, this transformation will require cohesive and holistic business leadership, long-term value creation, moving beyond short-term performance pressures that can prevent progress on sustainability, and new tools and approaches that prioritize and measure the impact of sustainability in a language that resonates with business. Although all that might sound complex and challenging, it is also a chance to fill latent gaps in many areas. Where challenges arise, opportunities also lie. For those who apply the blue ocean theory in their business strategy, sustainability challenges are one of the most exciting business development opportunities of our time, unlocking new demands in a competitive scenario. 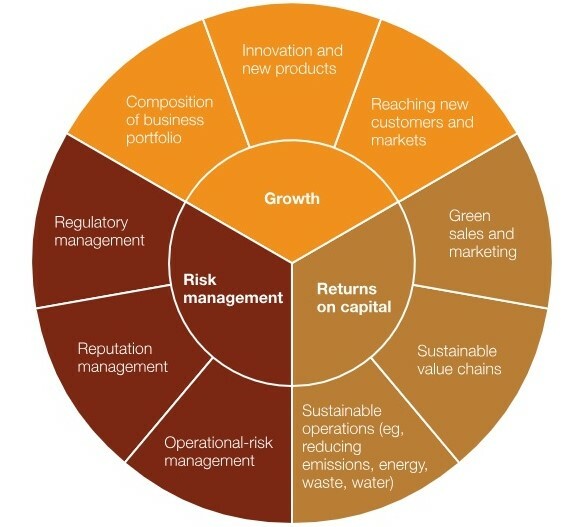 Leading companies are managing their business portfolios to capture trends in sustainability. By doing so, they are discovering new markets, developing innovations and, consequently, generating new revenue opportunities while creating value for society. Companies have also an enormous opportunity to encourage sustainable customer behavior by the way they design or shape their offerings. As customers’ behaviors change, their demand for sustainable products and services increases. This “virtuous cycle” moves the society in a more sustainable direction and builds market opportunities at the same time. How to capture value in sustainability? Improving returns on capital often means reducing operating costs through improved natural resource management (such as energy use and waste) and systematically managing value chains. Wal-Mart, for example, generated USD 12 billion in global supply chain savings through a packaging “scorecard” that reduced packaging across the company’s global supply chain. Moreover, companies can add value by improving employee retention through purpose alignment, raising prices or achieving higher market share with new or existing sustainable products. By revisiting their business portfolios, companies can determine the potential impact of trends that could lead to new growth opportunities or customer segments with unmet needs. For example, by assessing the life cycle of steel products, ArcelorMittal innovates through the development of offerings that minimize steel’s negative environmental impacts. GlaxoSmithKline is gaining significant share of sales in potential new markets by adopting a range of flexible pricing models for patented medicines in less-developed countries with unaddressed diseases, making them affordable for customers without compromising profitability. Better management of risks that arise from sustainability issues begins with detecting key risks of operational disruptions from climate change, resource scarcity, or community issues. Faced with potential supply constraints, Nestlé, for example, launched a plan in 2009 that coordinates activities to promote sustainable cocoa: producing 12 million stronger and more productive plants over the next ten years, teaching local farmers efficient and sustainable methods, purchasing beans from farms that use sustainable practices, and working with organizations to help tackle issues like child labor and poor access to health care and education. Indeed, organizations exist to meet a market need that creates the conditions for financial sustainability. However, action on sustainability challenges is not at odds with economic growth. 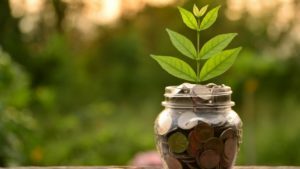 In fact, several examples in this article have shown that making sustainability the starting point of the business strategy makes a lot of sense. Sustainable business models enjoy more bottom-line benefits, such as driving disruptive innovations, exploring new opportunities, reducing risk and uncertainties, and engraining a sense of purpose throughout the organization. Thus, incorporation of environmental and social values ​​into the foundation of the business strategy is the answer for enduring profit and growth and the key to a future-proof business. The most sustainable organizations are the ones that make the sustainable way the normal course of business.